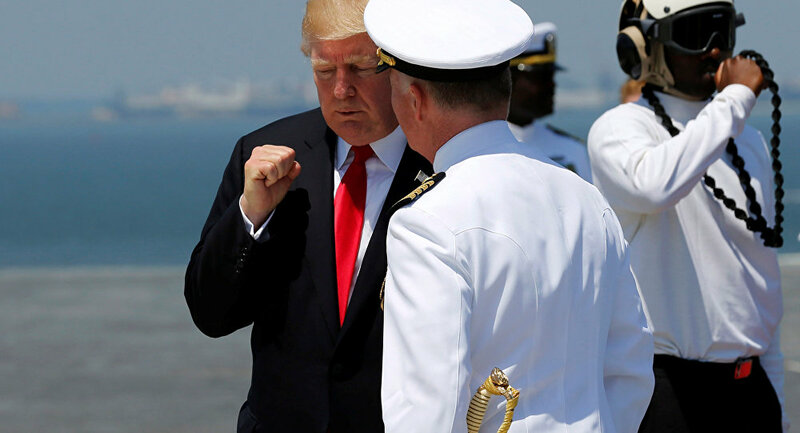 President Donald Trump commissioned the US Navy's newest aircraft carrier at the weekend but it will not be ready for service for another four years. The USS Gerald R. Ford was delivered almost three years behind schedule and needs large amounts of work before it is even capable of full sea trials. "USS Gerald R. Ford (CVN 78) is the lead ship of the new Gerald R. Ford class of aircraft carrier, the first new class in more than 40 years," said the US Navy on Saturday, July 22. The carrier is named after the 38th President of the United States, a Republican who took over in the White House in 1974 after Richard Nixon resigned after the Watergate scandal broke and was turfed out by voters at the first opportunity two years later. ​Ford, who died in 2006, served in the US Navy during the Second World War. But the 100,000 ton carrier which bears his name has been hit by problems and has been delivered way behind schedule and way over budget. ​The US Navy is planning to enlarge its fleet from 276 to 350 ships after years of cuts and to increase the number of carriers it has from 10 to 12. The US Defense Department says the Ford-class feature significant advancements over their predecessors, including having an electromagnetic aircraft launch system, advanced arresting gear, dual band radar and integrated warfare systems, according to the release. But their introduction has been fraught with technical problems. 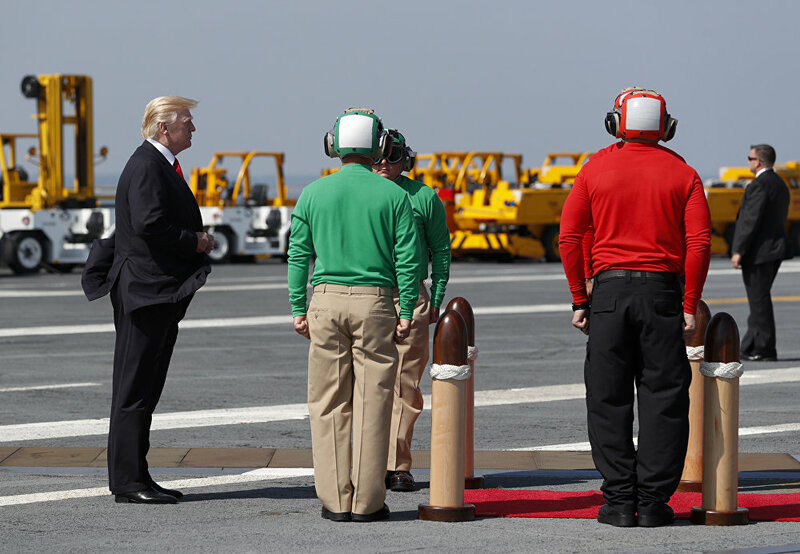 President Donald Trump pauses on the flight deck as he arrives for the commissioning ceremony of the aircraft carrier USS Gerald R. Ford (CVN 78) at Naval Station Norfolk, Va., Saturday, July, 22, 2017. The Government Accountability Office said the USS Gerald R. Ford still had a "significant amount of outstanding construction, tests and sea trials." It says US$780 million will have to spent on correcting deficiencies, conducting shock tests and fitting out the ship, which was built by Northrup Grumman's shipbuilding subsidiary Huntington Ingalls Industries Inc, at its Newport News yard in Virginia. ​The Gerald R. Ford has "yet to complete its navigation certification and cybersecurity inspection," and is not in a state where planes can take off or land on it either. In June, it was reported the carrier cannot launch fighters because of software issues with the new electromagnetic catapult system. The Ford class carriers will gradually replace the Nimitz class of carriers. The first of that class was the USS Nimitz, which was built in 1975, and named after the wartime Admiral Chester Nimitz, and the last was the USS George H. W. Bush, named after another former president, which was launched in 2009. In June, Sam LaGrone, a USNI News editor who has been tracking the development of the Ford for several years, explained that delays and cost overruns notwithstanding, the vessel marks a substantial upgrade to the US Navy's capabilities. "The biggest difference between the Ford and the Nimitz class aircraft carriers of the previous generation is its ability to launch aircraft," he told Sputnik. "The entire aircraft carrier is designed around the idea that it can launch 30% more aircraft during a particular period than the Nimitz class. That's kind of the central idea behind the Ford versus the Nimitz," he said.